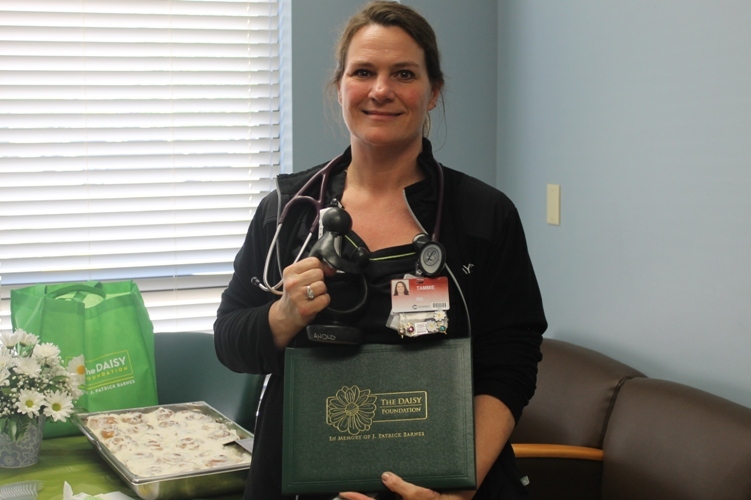 Tammie Williams, RN in the Emergency Department is HaysMed’s newest DAISY Award Winner! Williams was selected from a group of blinded nominations voted on by the HaysMed Practice Committee. The Practice Committee consists of Staff and Supervisors from a variety of departments across HaysMed. Nominations are received from patients and family members, physicians, volunteers and Associates for nurses in inpatient, outpatient and clinic settings. “Her nomination epitomizes teamwork, leadership and customer service,” said Terry Siek, VP of Patient Care Services and Chief Nursing Officer at HaysMed. “We are so fortunate to have nurses of her caliber and dedication working at HaysMed.” Williams has been an Associate of HaysMed for 18 years.